Carry trusted quality in a compact and attractive package with the Smith & Wesson CK111 Extreme Ops Black-Blue Plain Edge Folding Knife. Designed to stand up to the demands of the active handyman and outdoor enthusiast, the CK111 features a rugged stainless steel construction that is guaranteed to outlast its competitors. 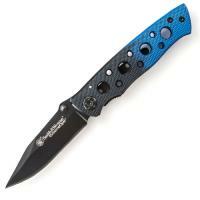 The drop point style blade maintains a forceful, controllable tip with plenty of cutting belly. Dual steel thumb studs offer ambidextrous opening with a quick flick of the wrist. The textured handle keeps hands from slipping while the blue and black finish really makes this knife stand out. Cut with confidence knowing linerlock technology keeps open blades in a fixed and secure position.